August’s retail sales performance reaffirmed the notion that the U.S. economy is on the precipice of a breakout. Most notably, limited wage growth has continued to restrain consumers from stomping on the economic accelerator. Additionally, Americans have developed a thriftier mindset in the aftermath of the recession that has led to a higher savings rate and reserved borrowing patterns despite elevated consumer sentiment. These headwinds should dissipate in the coming months as positive economic news broadens. Year-over-year wage growth is trending near the post-recession high, and household income in strong technology markets has surged. The improving job market will entice discouraged workers back into the labor market, and as a greater portion of the population is employed, new households will be created, in turn boosting retail sales. As expected, retail sales jumped in August as consumers went back-to-school shopping, though the welcome surprise was an upward revision to June and July’s previously announced figures. Overall, retail sales jumped 0.6 percent last month, lifting the annual gain to 5.0 percent, which reversed a trend of slowing growth. Excluding autos and gas, retail sales advanced 4.8 percent over the past 12 months. Nearly all of the discretionary spending categories landed on the positive side, indicative of healthy consumption patterns. Only gas stations were a major detractor, though falling fuel prices predicted last month’s result. Inflationary pressure could be looming, potentially posing a threat to retail sales and the broader recovery. The seven-year run of low interest rates has significantly expanded the money supply, while the pace of inflation has remained lethargic. If the Fed maintains its growth-centric stance when considering interest rate hikes, inflationary pressure could outdistance the Fed’s ability to apply the brakes without upending the economy. Other than August’s somewhat weak job report and still-high underemployment, few justifications to stimulate growth through asset and bond purchases or an early 2015 rate hike remain. The prolonged low-interest-rate environment has reshaped the single-tenant, net-leased investment market. Capital preservation has become a much greater motivator for purchases, particularly from retiring baby boomers. The alternatives to single-tenant properties leased by corporate-backed tenants are limited and generally riskier. As interest rates climb, investors will find other safe havens for retirement funds, bringing balance back to the single-tenant market. Retailers are relying on technology rather than people to drive retail sales higher, though employment in the retail trade sector is advancing as space is absorbed. This year, retailers will add 270,000 workers, lifting payrolls to within 60,000 jobs of the pre-recession level. Retail vacancy, meanwhile, will decline to 6.5 percent on space demand growth of 1.2 percent. 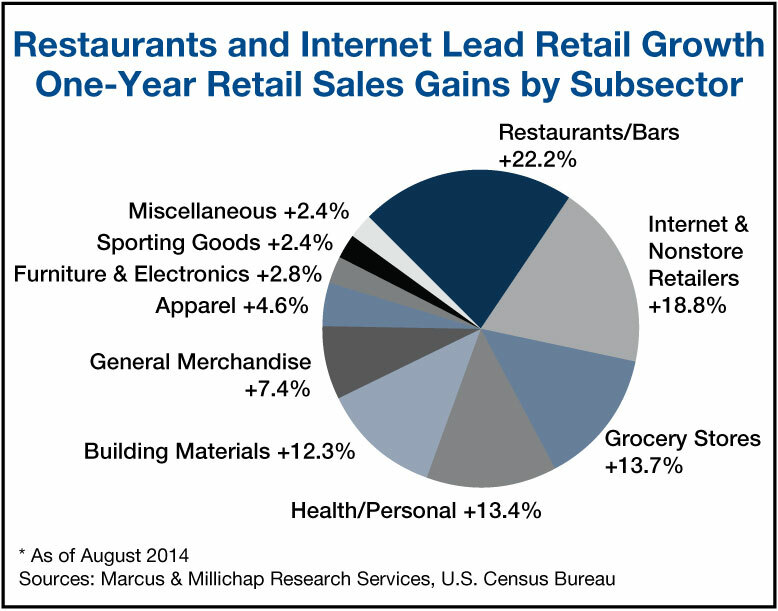 This entry was written by marcusmillichap, posted on September 19, 2014 at 6:28 pm, filed under Research and tagged Commercial Real Estate, E-Commerce, Retail Sales, Retail Sales Growth. Bookmark the permalink. Follow any comments here with the RSS feed for this post. Post a comment or leave a trackback: Trackback URL. Thank you for posting this information. The +12.3% for Building Materials looks like a very positive trend. I am curious how this impacts local markets specifically. I have noticed increased builder activity in the Indianapolis real estate market and would like to know where we stand compared to the National average.